Table games at Golden Nugget Las Vegas include the European exclusivity of mini-baccarat; the red-hot energy of craps; plus blackjack, roulette, and plenty more. There's also an enticing newly remodeled poker room where there's always a game available. Big stakes for are available for seasoned players and high rollers, while free lessons can be arranged for rookies. Golden Nugget Las Vegas also has more than 1,200 slot and video poker machines, including some of the most popular games ever created. 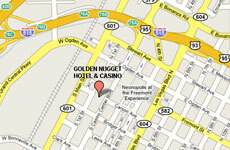 Golden Nugget's Nouveau Slot Salon offers the newest games in the market. Keep your fingers clean with Quickets™ - the cashless way to play. Instead of dealing with a cumbersome bucket of coins, you'll get a ticket when you leave a winning machine. Insert that ticket into a kiosk, and get cash, or receive credits when you place the ticket into another machine. 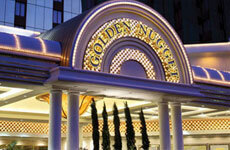 Golden Nugget's Race and Sports Book is the plushest, most inviting book of its kind. It has a giant video wall, plus a screen at every seat - giving it more TVs per square foot than any book in Nevada. Luxurious booths and a cool décor make this the perfect place to spend a game night, a race day, or for the ambitious, an entire Sunday of football and more football. Meanwhile, Golden Nugget's new Poker Room has 10 smoke-free tables, comfortable seats and plush décor. Various levels of live cash poker games are always available. In addition, daily Texas Hold'em tournaments are held at 1:00 a.m., 11:00 a.m., 3:00 p.m. and 7:00 p.m. Daily tournaments have a $65 buy-in with one optional $40 re-buy. Free lessons are offered daily at 10:00 a.m. And there is always a special promotion or cash giveaway for poker players. Tables can also be reserved for private cash games, tournaments or functions.